NGC, National Garden Clubs, Inc.
District VI, YOUR district, is holding their spring meeting in Melbourne, FL on May 15, 2019. You are invited and strongly encouraged to attend this district meeting and find out what the district VI is all about. There is the opportunity to get to know other garden clubs in the area. Also a great lunch is served and multiple vendors offer shopping opportunities. You should all come and see what our District IV Meetings are like. 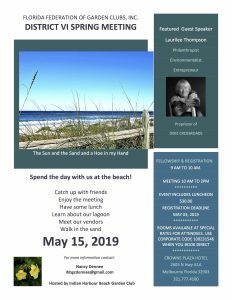 The meeting is on May 15th. We have a 50/50 raffle, raffle baskets and ways and means. Lots of fun – you will have a wonderful time and meet more gardeners. Please consider joining us. Call me with any questions or send me an email for more information.